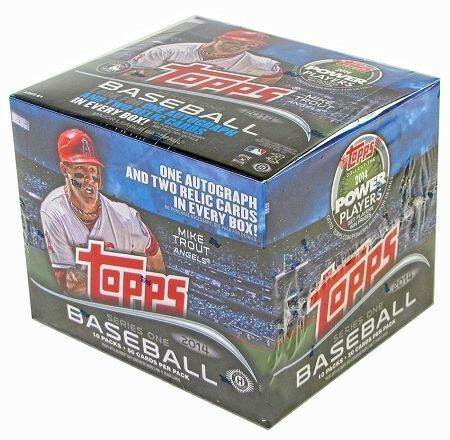 Factory Sealed 2014 Topps Series 1 Baseball Jumbo Box mit 10 Packs a 50 Cards per Pack. 1 Autogramm und 2 Relic Cards per Box ! Produktinformationen "2014 Topps Series 1 Baseball Jumbo Box MLB"
Look for Strata Signature Relic Cards! Baseball is witnessing an unprecedented explosion of young talent, a changing of the guard, as rookies and young stars are playing a bigger role than ever and taking over the League. In celebration of this passing of the torch, 2014 Topps Baseball Series 1 will feature these exciting new stars, as well as lookback at the roots of some of the greatest players of today and yesterday. The future is now. Key Rookies: Xander Bogaerts, Billy Hamilton, Michael Choice, Kolten Wong, Enny Romero, Taijuan Walker, Erik Johnson, Travis d'Arnaud, Yordano Ventura. Featuring Veterans, Rookies, League Leaders, 2013 Baseball Highlights, World Series Highlights, and the return of Future Stars. - Gold Parallel sequentially numbered to 2014. - Camo Parallel sequentially numbered to 99. - Pink Parallel sequentially numbered to 50. - Platinum Parallel numbered 1/1. - Red Hot Foil Parallel inserted 1:6 packs. - Clear Parallel Printed on clear stock! Sequentially numbered to 10. HOBBY ONLY - NOT FOUND IN JUMBO PACKS! Cards featuring Topps' selections for the all-time All-Rookie Cup team, with a replica Rookie Cup embedded in the card. Sequentially numbered to 99. Additional players who have received the Topps Rookie Cup designation, with a replica Rookie Cup embedded in the card. Sequentially numbered to 99. Featuring 25 of the greatest players of all time, with an embedded commemorative ring top celebrating the year of his rookie class. Featuring a gold ring with replica gems embedded in the ring. Sequentially numbered to 25. The same cards as above, but also with an autograph. Sequentially numbered to 10. The Future Is Now (30) - Cards featuring the top 10 young players and each of their 3 best moments in the League so far. Inserted 1:4. Upper Class (50) - Cards recognizing the best rookie classes of all time. Inserted 1:4. 50 Years of the Draft (10) - Cards celebrating the 50th incarnation of the draft, with some of its most memorable past moments and selections. Inserted 1:18. Topps All Rookie Cup Team (10) - Cards featuring Topps' selections for the All-time All-Rookie Cup team. Inserted 1:18. 1989 Topps Minis Die Cut (50) - Mini cards using the 1989 Topps design and die-cut around the perimater. Inserted 1:18. Trajectory Autographs - Autograph cards illustrating the player's progression from his rookie season to now. The Future Is Now Autographs (30) - Numbered to 25. Upper Class Autographs (25) - Numbered to 50. Topps All Rookie Cup Team Autographs (5) - Numbered to 50. 1989 Topps Minis Die-Cut Autographs (10) - On-card! Numbered to 10. World Series Champion Autographs (5) - Featuring members of the 2013 World Series Champions with an autograph. Sequentially #'d to 50. Postseason Performance Autographs (10) - Featuring other standout performers from the 2013 Postseason with an autograph. Sequentially #'d to 50. Trajectory Relics (40) - Relic cards illustrating the player's progression from his rookie season to now. The Future Is Now Relics (30) - Numbered to 99. Upper Class Relics (25) - Numbered to 99. Topps All Rookie Cup Team Relics (5) - Numbered to 99. 1989 Topps Minis Die-Cut Relics (15) - Numbered to 25. World Series Champion Relics (15) - Featuring members of the 2013 World Series Champions with a relic. Sequentially #'d to 100. Postseason Performance Relics (25) - Featuring other standout performers from the 2013 Postseason with a relic. Sequentially #'d to 100. Strata Signature Relics - The breakout hit comes to Topps Baseball! Featuring stars, both active and retired. On-card! Numbered. Strata Cut Signatures - Numbered 1/1. The Future Is Now Autograph Relics (30) - Numbered to 10. Upper Class Autograph Relics (25) - Numbered to 25. Topps All Rookie Cup Team Autograph Relics (5) - Numbered to 25. Before They Were Great Autograph Relics (10) - Numbered to 5. Signed On-card! World Series Champion Autograph Relics (5) - Featuring members of the 2013 World Series Champions with an autograph and a relic. Sequentially #'d to 50. Postseason Performance Autograph Relics (10) - Featuring other standout performers from the 2013 Postseason with an autograph and a relic. Sequentially #'d to 50. - Silver Framed - Numbered. - Gold Framed - Numbered. Top 50 Rookie Buyback Redemptions The top 50 Rookie cards in Topps history will be up for grabs! The Pennant Chase - Every team will have a Pennant Chase card in product. If the club wins the pennant, it can be redeemed for a prize. Spring Fever - The popular in-store redemption program from 2013 returns. 1 per Hobby and HOBBY Jumbo box. Weiterführende Links zu "2014 Topps Series 1 Baseball Jumbo Box MLB"
Fanbewertungen für "2014 Topps Series 1 Baseball Jumbo Box MLB"